"The fair maids that weave their threads with bones"
This book of helpful hints is like trying out for a role in a Shakespearean play. You are nervous. The director (Dye) recommends being very free in your approach - copying and adapting to suit your lace threads (lines) and their proposed use, without relying on a rigid pattern (script) or believing there is only one way of doing things. This is what early lace makers seem to have done. Early substitutions for bobbins were made from bones of small animals and game birds - thus, the name. Dye efficiently describes lace equipment and materials (staging scenes and props). She has gone on to clearly show how to wind thread onto bobbins (use stage props), and proceeds to the business of basic lace moves (stage directions). Right away, you are introduced to 2-pair plaits and plait projects, which launches the beginner into a variety of plaits in a sampler. Now that the "rehearsal" is over, one can get to the main performance. As in all her books, Dye simplifies what another author could make complicated. All elements that are tricky to understand are clearly explained - metal threads, spangles, bits and pieces seen in early portraits that have been deciphered by Dye and rendered in comprehensible directions. The booklet contains many special tips that Dye has generously shared with readers of Guild Magazines. To have put them in this booklet is a good idea, because so many who make lace may not be members of a very large guild. They would not have the benefit of these captured "pearls of knowledge" had they not been published in this format. This 44-page booklet can be easily tucked into your tote bag with lace making supplies, and hardly add weight. 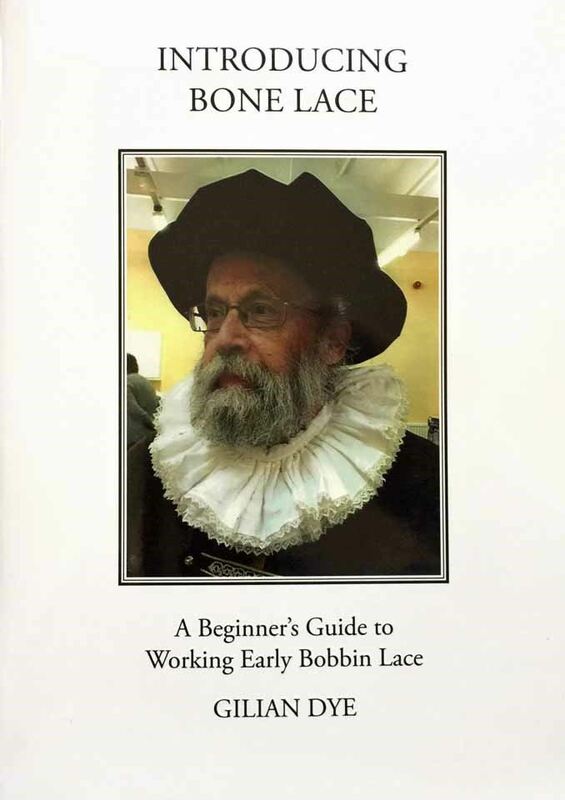 If you have been collecting all of Dye's 16th and 17th century instructional booklets about working early bobbin lace, you will want this one. The entire body of her work researching this period in lace development is a wonderful way to introduce a new lace maker to the process, so they can add authentic lace elements to costumes of the period. The photo on the cover is of a gentleman who is a costumed guide at Hardwick Hall in England. The small edging of bone lace on the rim of his white ruff is an important element of his costume. Learn to make "bone lace", which requires a limited number of bobbin pairs, and you will discover delightful ways to use it in 21st century applications. To protect the various booklets in a crowded bookcase, you may wish to consider what this reviewer has done - put them in a clear plastic legal folder with tie from an office supply store - to hold them all neatly together. Should you benefit from a class with Dye, you can add all you collect from that experience as extra documentation.